A man and his dog jumped into a frozen pond to save two other dogs that had fallen through the ice in a heroic rescue that was caught on video. Gaby Acevedo reports. 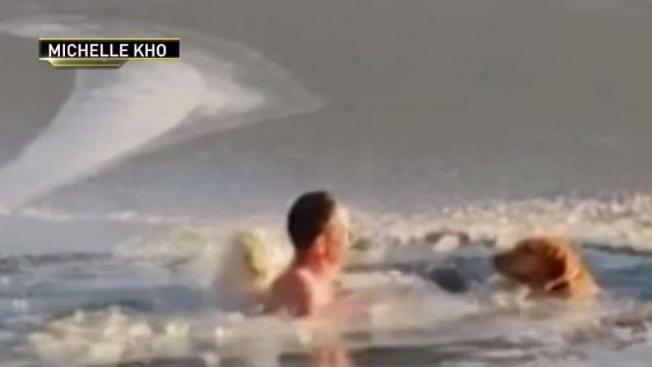 A man and his dog jumped into a frozen reservoir to save two other dogs that had fallen through the ice in a heroic rescue that was caught on video. Yonkers resident Timofey Yuriev was walking around Irvington Reservoir with his wife and dog when they heard a woman screaming, he told News 4. “First we heard the screaming, the woman was screaming for her dogs… and then we saw two dogs crossing the lake,” Yuriev said. The two dogs had somehow fallen through the ice and were paddling in place, but had started to get tired and give up. That’s when Yuriev sprang into action. “I was looking at them and I realized, alright, so… the rescuer, they will come maybe in 10, 15 minutes. The dogs might have hypothermia,” he said. Yuriev’s English Golden Retriever, Kira, went in after him, the video shows. The two of them were able to successfully save the two canines. “She loves this environment, [she] especially… loves cold water,” Yuriev said of his dog. Before he jumped into the Irvington Reservoir, Yuriev made sure his body was up for the challenge. “Because of my past, I used to live in Siberia - my grandfather, a hunter, he taught me how to stand cold, and how to prepare yourself,” he said.